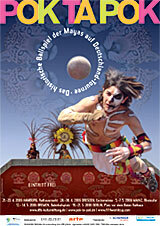 Today we play football, 3000 years ago in mexico people played pok ta pok. The archaic form of the mayas ballgame has been reconstructed through archeological finds. In the course of the art- and culture program by the german government for the FIFA World Cup 2006 TM, in association with the OK FIFA WM 2006 Artevent GmbH Wien is organizing a tour through germany by the only group of pok ta pok players that has been autheticated by the mexican government. The game is played in an arena that has been designed solely for this tour, it is based on the design of historical examples, consisting of a pyramid construction with a ring on ist long side, through which the players have to deliver the ball. The teams consist of four players each. In this arena, up to 500 people can watch the event as spectators. During the 21st of April and the 22nd of May, the tour leads ‘pok ta pok’ in five cities – Hamburg, Dresden, Bremen, Mainz and Berlin – and thus it will present the roots of football in the host country of the Football World Cup during the immediate preparations. It is planned to have three days (Friday, Saturday, Sunday) per tourstop, while on Friday the city premiere is celebrated with a fire game during which the burning ball has to be delivered through a flaming ring. Saturday and Sunday will see three games each, two of which will take place during the afternoon and one at nightfall. The game itself breaks into a ritual preperation phase, a phase of warm up and two half-times. All together the performance will last about half an hour. After the premiere, the weekly german journal ‘Die ZEIT’ invites for the ZEIT dialogue. During that dialogue some prominently cast guests will talk about the pok ta pok game and the latest happenings about football. ‘ZEIT’ head editor Giovanni di Lorenzo or ‘ZEIT’ publisher Michael Naumann are looking forward to having illustrious guests from society, culture and sports. Pok ta Pok, Aufführungsorte, Partner, Presse, Hintergrund, Pok ta pok ist ein offizieller Teil des Kunst- und Kulturprogramms zur FIFA WM 2006, daher wird in diesem Frühjahr 2006 die einzige (durch die mexikanische Regierung) anerkannte Gruppe von »pok ta pok« Spielern in authentischer Bekleidung nach den belegten Regeln im Nachbau einer historischen Anlage spielen: einer Arena, eingefasst von Zuschauertribünen, an deren Längsseite der Ring angebracht ist, durch den die Akteure den – brennenden – Ball befördern.